Gisele Bundchen takes Boston area helicopter pilot lessons. 8 years ago today. Some know her as a supermodel, others as the wife of New England Patriot QB Tom Brady, or as a super mom. She has been a champion for the environment, and a spokesperson for the United Nations, and the Brazil olympics. 8 years ago today I knew her as an aspiring helicopter pilot, 6 months pregnant. Good for her, she can do anything. September 21, 2009, a day that most surely will be etched in my mind forever. I arrived at Marshfield Airport at 6am and waited and hoped, on a tip, that Gisele would be flying a helicopter with flight instructor Stuart Matsumoto. All of a sudden, there she was and away she went. Gisele and Stuart stayed up for almost 2 hours before gliding the craft to a perfect landing. Posted in Uncategorized | Comments Off on Gisele Bundchen takes Boston area helicopter pilot lessons. 8 years ago today. Feeling sad for hurricane-bashed St. Martin/St. Maarten. Remembering the good times. I’m seeing more and more dire reports regarding the knockout punch that Hurricane Irma delivered to St. Martin/ St. Maarten. My first trip to this beautiful island was in 2004. I did a travel piece for the Boston Herald. 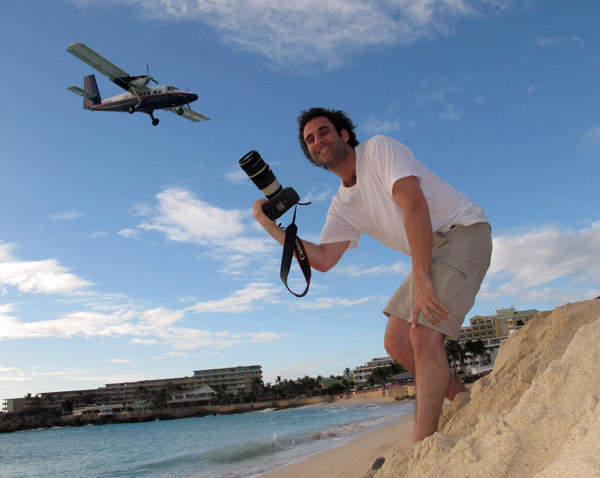 I focussed on the Island’s unique airport that abuts Maho Beach. This is an aviation enthusiast’s paradise. 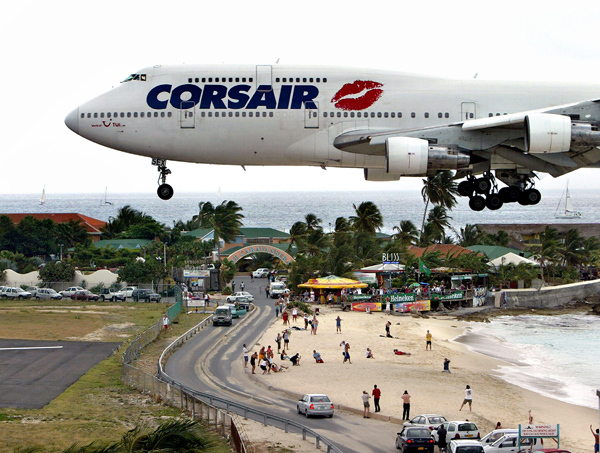 The relatively short runway forces arriving aircraft to make a very low approach over the beach. 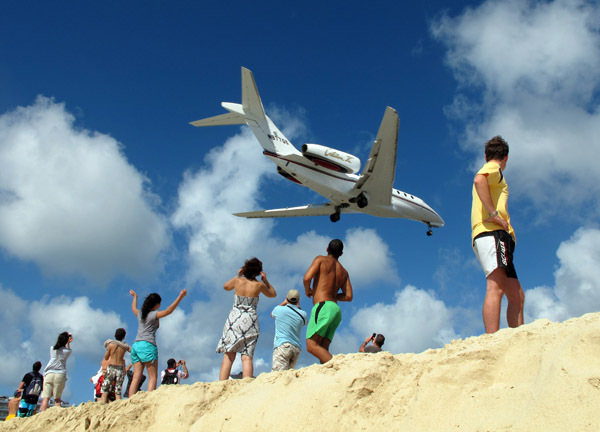 If you have not seen any photos of the jet arrivals at this beach, then you really are missing something. People come from all over the world to experience the exciting landings and the even more hair raising departures. The second visit that I was lucky enough to enjoy, was with my wife Laura, in 2011. We stayed at Le Petit Hotel, on the French side of the Island. We rented a car and drove throughout the island. The permanent residents were very nice and accommodating. The French side is quiet and very beautiful. We did find a short period of time to view the airplanes at Maho Beach. The temperature was 82 degrees when Laura and I trotted over to the Sunset Beach Bar, the unofficial headquarters of the Princess Juliana Airport fan club. 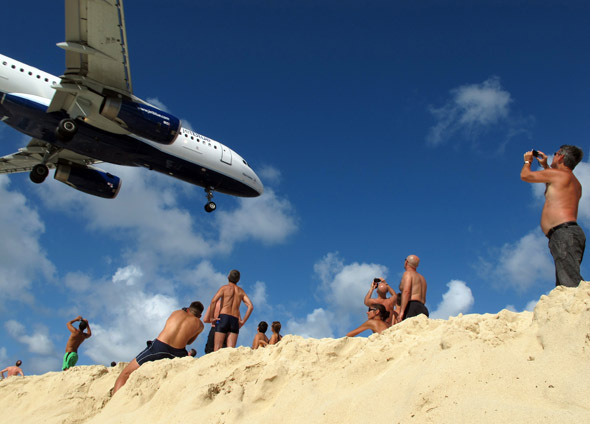 There was a large crowd awaiting the day’s arrivals, and waiting for the larger departing planes so that they could get blown into the ocean by the large jet engine’s fan bladess, a Maho beach tradition. The incoming airplanes arrive only 50 feet-or so overhead of the people watching them. I wish the people of SXM well in their recovery, and look forward to visiting soon. Posted in Uncategorized | Comments Off on Feeling sad for hurricane-bashed St. Martin/St. Maarten. Remembering the good times.